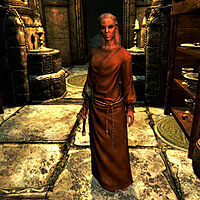 Hamal, a Nord priestess, is also known as "The Mother" to the priestesses at the Temple of Dibella. She can normally be found inside the Inner Sanctum of the temple. Hamal is a master trainer for Enchanting (up to 90). After completing the quest The Heart of Dibella she will be available for training. Hamal wears simple monk robes and a pair of boots. She carries a steel war axe of ice, an iron dagger, the key to the temple of Dibella, the key to the inner sanctum, and a few common items and gold. This page was last modified on 8 April 2013, at 23:48.